The Antiques Barn at Fiddlehead Farm in North Granby, Connecticut is filled with vintage retro furniture, china, and uncommon decorative accents for your home. Our Antiques Barn has an eclectic assortment of vintage items that changes weekly. Whether you're furnishing a home for the first time, redecorating, or just looking for a special unique piece, the Antiques Barn at Fiddlehead Farm is the place for you! Let us search for you to find the perfect piece for that perfect place ~ all within your budget. We work with interior designers to find unique pieces for their clients to complement an existing style, or create a whole new look for a room. With our comprehensive well-priced collection, decorating with antiques is an economical and a creative process. Indulge in our sterling silver handcrafted unique jewelry and swarovski crystal earrings ~ they make wonderful gifts. We also offer specialty seasonal gift basket design featuring vintage items. 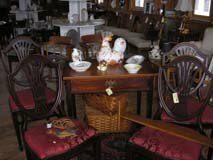 The Antiques Barn is all about great items at exceptional prices. The values you'll find here can't be beat in any furniture or antique shop. We welcome dealers and collectors one and all. Enjoy our sunny location on the mountain! Come visit us ~ The Antiques Barn is the perfect destination for a scenic drive. Enjoy the magnificent rural views from Fiddlehead Farm, and shop our unique and unexpected collection.